Does Chem-Dry of Northern Nevada offer coupons, specials or promo codes for carpet cleaning? Yes, at Chem-Dry of Northern Nevada we do occasionally offer coupons and special promotions. You can find our current coupons on the Coupons page. You should also follow us on Facebook, Google+ & Twitter to get the latest carpet cleaning coupons and be notified of promotions as soon as they are happening. All of the ingredients in Chem-Dry’s primary cleaner, The Natural®, are on the F.D.A.’s G.R.A.S. (Generally Recognized as Safe) list and are safe for your carpets, home, family, and the environment. Like the name states, The Natural® doesn’t contain any harsh soaps or chemicals but is rather composed of natural elements that are safe for your carpets. 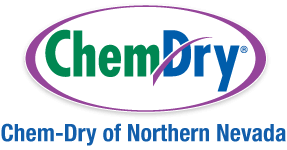 Is Chem-Dry of Northern Nevada a steam cleaning service? No, Chem-Dry of Northern Nevada is not a steam cleaner. We use carbonation to lift up dirt and grime from your carpets so we do not need to use the gallons of water typical steam cleaners use. Continue on to the next question below to see how Chem-Dry compares to steam cleaning. Chem-Dry of Northern Nevada’s process is very different. We employ millions of microscopic bubbles to explode dirt from deep in your carpet fibers, which is why we only need to use a fraction of the water than typical steam cleaners use. After the carbonation releases and lifts the dirt, our high powered equipment extracts the dirt and moisture from the carpet. The Chem-Dry of Northern Nevada cleaning process is considered by many to be superior and healthier than other methods for your carpet and upholstery cleaning. Chem-Dry’s unique hot carbonating extraction carpet cleaning method uses the power of carbonation to extract more dirt and grime from your carpets, giving them a deeper and longer lasting clean. Our carbonated cleaning solution only requires us to use a fraction of the moisture other methods require. This allows your carpets to dry faster, typically in 1-2 hours rather than 1-2 days and helps prevent the growth of mold and mildew under your carpet. Chem-Dry’s signature cleaning solution, The Natural®, is a cleaning mixture that—through the power of carbonation—lifts dirt to the surface where it is whisked away. The Natural® is non-toxic and ideal for homes with kids and pets and has received the Green Certification. Pet odors can linger for months if not treated properly. As urine dries in the carpet and padding, what’s left are millions of concentrated urine crystals that become even more pungent. Many companies just mask this odor. Chem-Dry uses a patented system, P.U.R.T.® (Pet Urine Removal Treatment), to explode urine crystals and break down the enzymes which get rid of the pet urine odor forever. Not with Chem-Dry of Northern Nevada. Many carpet cleaners including steam cleaners use soaps and detergents in their process. This often leaves behind a sticky residue on your carpets that attracts dirt, leads to carpets re-soiling quickly after being cleaned and often requires more frequent professional cleanings. At Chem-Dry of Northern Nevada, we use a natural, biodegradable carpet and upholstery cleaning solution that doesn’t contain any soaps, detergents or harsh chemicals, so it won’t leave any sticky or dirt-attracting residue. This is not necessary. As a standard part of our service, professionally trained technicians will vacuum your carpets with our commercial, HEPA-filtered vacuum when they arrive. Chem-Dry uses a natural, Green-Certified cleaning product called The Natural® as our primary cleaner. The Natural® doesn’t contain any soaps or phosphates and is safe, non-toxic and hypo-allergenic. By contrast, most steam cleaners use soaps, detergents and harsh chemicals in their process. Chem-Dry of Northern Nevada uses up to 80% less water than typical steam cleaning because its carbonated cleaner, The Natural®, relies on millions of microscopic bubbles to release dirt and grime from the fibers of your carpet and raise it to the surface where it can easily be suctioned away. This low water, a low-pressure approach is healthier for your carpets, allows your carpets to dry in only 1-2 hours and is also more environmentally friendly. In most cases, the furniture dries within just a couple of hours, but in some cases, it may take overnight to fully dry depending on the upholstery’s fabric and how deeply it was cleaned – i.e. heavily stained areas will take longer to dry. Manufacturers recommend professional upholstery cleanings every 24-48 months. As with carpets, the presence of kids, pets, allergies, and asthma in the home necessitates more frequent cleanings to improve air quality and the overall healthiness of the home. If furniture is stained, saturated or has unwanted odor then it is ready for a cleaning. Many factors need to be considered when determining the frequency of cleaning. Foot traffic, children, pets, and routine floor maintenance will affect how often you need to have your tile, stone & grout cleaning. If stains and discoloration are present then your tile and grout are ready for a cleaning.